Also known as Asar, Ausar or Serapis. Originally a fertility god, Osiris developed into the Egyptian god of resurrection, lord of the underworld, son of Seb or Geb and Nut, consort of Isis (Asi), and Nome-god of Abydos (Abtu, now Nag Hammadi). Identified by the Greeks with Dionysus, Adonis and Hades. Osiris is depicted as a human male with green skin, wearing the Atef Crown, wrapped in mummy’s bandages with his hands protruding, holding a crook against his left shoulder with his left hand and a flail against his right shoulder with his right hand. His sacred animal is the bull, and his sacred color is black (the sacred color of Set, his brother and enemy, is red). The formula of Osiris is IAO. See Part III of The Heart of the Master. According to legend, Osiris was born in Thebes, the son of the earth-god Geb and the sky-goddess Nut; and a loud voice proclaimed at his birth the coming of the universal lord. He was recognized by his grandfather Ra as the heir to his throne, which he assumed after his father Geb retired to the heavens, taking his sister Isis as his queen. Osiris was a just and well-loved ruler and Lawgiver of Egypt. His brother Set (god of the desert) envied his power and favor, and contrived to entrap him. 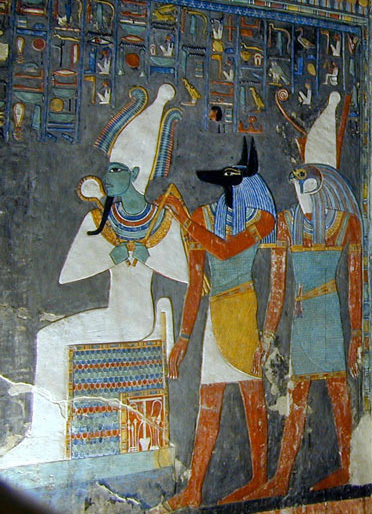 While Osiris was abroad with his adviser Tahuti, instructing the men of other lands in agriculture and religion, his wife Isis ruled Egypt in his place. Set took advantage of Osiris’ absence to made a sarcophagus of the precise dimensions to accommodate his brother’s body. Set then arranged for a great feast in honor of his brother’s return. After all had had their fill of drink, Set produced the richly ornamented sarcophagus, and offered possession of it to anyone who could fit inside it. Osiris, of course, accepted the offer, and as soon as he had laid down in the sarcophagus, Set slammed the lid shut, locked it, and with the assistance of his seventy-two comrades, hauled if off and threw it in the Nile, which carried it away. Set then claimed the throne of Egypt. After a lengthy search, Isis recovered the sarcophagus, and hid it away. Set, however, discovered it– he seized the body of Osiris, cut it into fourteen (or sixteen) pieces and scattered them all over Egypt. Isis set forth in a reed boat to recover the pieces, and succeeded in finding all but one, the phallus, which had been devoured by a fish. With the assistance of her sister Nephthys, her nephew Anubis and Tahuti, she reassembled them, binding them together in the wrappings of a mummy. Isis then begat a son, Horus, by lying on top of the body of her dead husband. To avenge the death of his father, Horus set out to make war against his brother/uncle Set. The battle was fierce, and Set tore out the right eye of Horus. Nevertheless, Horus availed in the end; but as he was about to kill his enemy, Isis intervened and allowed Set to escape. Enraged, Horus severed his mother’s head– which Tahuti replaced with the head of a cow. Horus claimed the throne of his father which had been stolen by Set, then resolved to find his father’s corpse and restore him to life. Under the direction of Tahuti, he recited a series of incantations over his father’s body and embraced him, transferring to him his own vitality. He then gave him his eye, which Set had previously torn from his face. Upon eating the eye, Osiris recovered his consciousness, and arose as Monarch of the Dead and Lord of the Underworld. According to Forlong, the worship of Osiris included the presentation of sacred cakes, called Mest, along with a sacred wine cup.